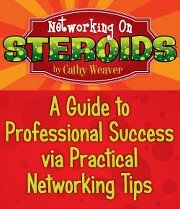 When I published my first book, “Networking On Steroids” in 2012, I really had no idea the reach this publication would have. I had personally experienced the many different ways that people Network, but when I narrowed it down to techniques, everything changed for me. I attended 8 events in ONE DAY just to see if it could be done – WOW – it can but it was overwhelming to say the least. That is the day the NAME OF MY BOOK came to be. There are steps for Networking – There are techniques for Networking – There are effective follow-up methods for Networking – and I wanted to be able to help people get over many of the hurdles I have encountered. One of my presentations I have incorporated now into my workshops is, “What’s in Your Networking Toolbox?” and it has been very well-received. I am able to offer this fun and interactive workshop in person or in my favorite tele-conferencing system, Zoom, so that people all over the Country can have the same advantages when out navigating the Networking waters. If you and your team/company are interested in this workshop, connect with me via www.CathyWeaverKC.com and we can discuss your specific needs. Continued Abundance.